Photo: Courtesy of The Face Shop. A dollar can't buy you much these days — seriously, even gum costs more than a Washington. But, two dollars? Well, that can buy you a brighter, more hydrated face. My face took a Knicks-level beating from the three polar-vortex episodes (or was it four?) that pummeled the Northeast this winter. I had random patches of dry skin on my cheeks that wouldn't go away even after a nightly routine of exfoliating and slathering my face with all the oils, serums, and creams I owned. And, just when I thought the annoying patches were gone in the morning, they'd magically reappear when I used my BB cream, resulting in unsightly, cake-y blobs. It was just bad all around. So, one night, I went for a Hail Mary and slapped on a sheet mask (you know, the cotton ones with cut-outs for your eyes, nose, and mouth) as I watched an episode of Brooklyn Nine-Nine on Hulu. Fifteen minutes later, I peeled it off, finished laughing at Gina making fun of Boyle, and fell asleep. It wasn't until I was inspecting my face the next morning that I realized my skin looked kinda radiant, felt more hydrated, and most importantly, was free of dry, dime-sized patches. As in, gone. 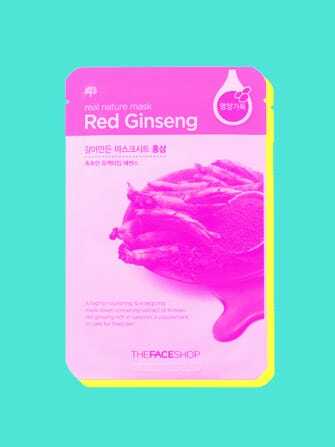 Sheet masks are popular buys in Asia, and I've used them here and there ever since I bought a stash of 20 in Tokyo a few months ago, but I never really turned it into a routine. Until I saw the effects they had on my winter-ravaged face, that is. Good thing I bought them in bulk! For a mere $2, the cotton sheets dipped in liquid formulas containing essences of aloe, red ginseng, hyaluronic acid, bee venom, and snail slime (yeah, it's a thing) have been my mug's saving grace all season. I've even tried fancy ones from high-end luxury brands (which were all great), but nothing quite beats a cheap thrill. Sure, the ingredients in the sheet masks and the long-term effects are slightly questionable — there's no way collagen essence will make my skin look like a newborn baby's. But, that's a given considering the price tag. And, frankly, I don't really care because whatever is in them is working. Unless you're a serious jet-setter or have a best friend in Japan or South Korea willing to ship you a Costco-sized box of masks, you can find them online at Soko Glam, or my personal favorite, Kollection K. The Face Shop in midtown Manhattan has a great stash of masks starting at $2, too. Seeing as how we're still getting punished by Mother Nature's wrath (who's ready for another bout of snow this weekend? ), it looks like I'll be buying another round of masks very soon. The Face Shop, 35 W 32nd Street; 212-967-0515.